We were lucky to have Craig Barton visit our school last week. He introduced a wonderful and simple diagnostic tool, Diagnostic Questions. At the start of a lesson a teacher can quickly diagnose misconceptions and address them easily. 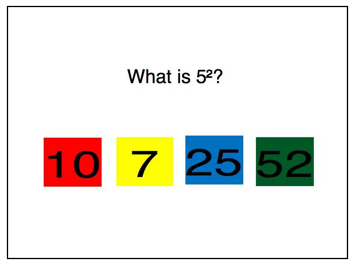 In my Grade 4 class I was re-introducing squared numbers (last seen in Grade 3). I wanted to know who remembered the written format and who had misconceptions. The students voted on the answer they thought was best. They needed to be prepared to explain their answer. Once all answers had been explained, we re-voted. By listening to each other, most students changed their vote to the correct answer. They were either reminded of the concept of squared numbers or they were convinced by a classmate. The correct answer was discussed and a few examples given. As a teacher, I was now confident that my students would go into their Maths inquiries of squared numbers with no misconceptions. It is a very powerful tool.